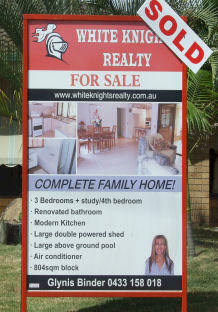 At White Knights Realty, we have complete confidence in our selling abilities. That's why we offer you 100% free advertising on all exclusive listings. We believe that if your property is priced right and marketed right - we can sell it alright! We charge the standard commission rate which is 5% of the first $18,000 and 2.5% of the balance + 10% GST. We believe that this is sufficient payment for the marketing & sale of your property and therefore all advertising expenses are payable by us! And best of all: No Sale = No Fee. Guaranteed. Don't pay $1000 or more with other agents. We'll give you MORE for FREE! What have you got to lose? Call today 07 3208 4505 parate houses, 9.3% were semi-detached, row or terrace house, townhouse etc, 3.2% were flat, unit or apartment and 0.9% were other dwellings.